Please DO NOT USE @BIOS!! I have seen many Boards killed (IE: Bricked, that is your motherboard is now a brick and you will have to RMA your board) by using @BIOS. I would guess that more then 90% of RMA's due to a bad flash, were because of @BIOS alone. 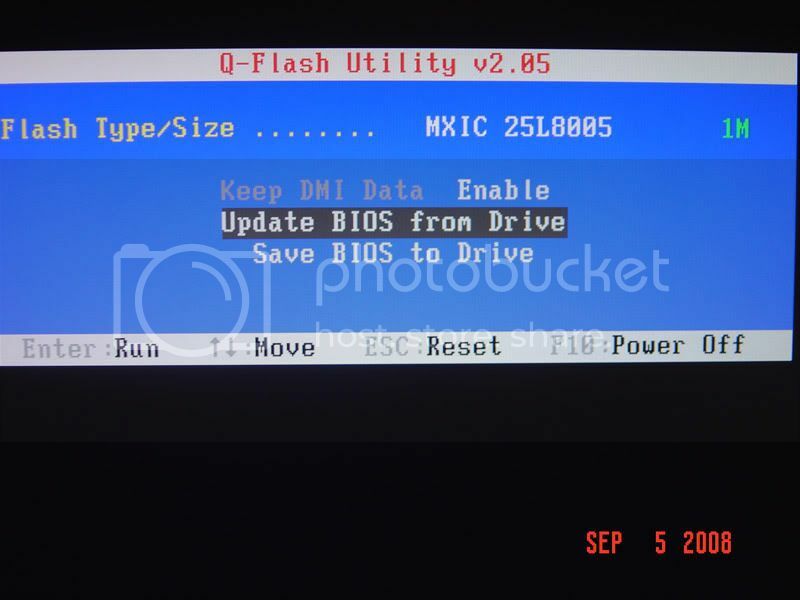 BIOS is a Acronym for "Basic Input/Output System"
You have 4 available Options when flashing the BIOS with Qflash. A bootable USB Drive is Useful if you have issues with a normal USB type Qflash flash, or are trying to recover from a bad flash.........otherwise making a Bootable one is not necessary. However you may still make and use it if you find it easier for you. Board_Name_Example.F10, with the .F10 being the BIOS file extension in question, thus .Fxx will be used to discuss BIOS files below. First thing you MUST be sure to do is manually download the correct BIOS for your board model and board revision from Gigabyte Web Site Below. You will need to Extract the BIOS file you need, the .Fxx file, from the Downloaded .exe (SFX.EXE) file to be used in Qflash. As for the rest of the Gigabyte users, I have recently noticed that the actual files from gigabyte can be extracted from windows with no additional programs needed. Simply click "Install" (Which Means Extract) and the files will be extracted to the folder you have the exe in. Or you may also use the "Browse" Button and choose where to extract the files. Put the .Fxx file onto a FAT32/16/12 USB drive, or in your FAT32/16/12 partition and enter Qflash. You may also make a new 1GB FAT32 partition on your disk if you like and keep BIOS files there as well. You may also make a USB Bootable drive, covered below, if you have issues with your board seeing your formatted USB stick. To Get into Qflash Select "END" at bootup, or F8 Within the BIOS to enter Qflash. To use USB in Qflash you need "Legacy USB Storage Detect" Enabled in the Integrated Peripherals Page of the BIOS. You also need to leave the USB drive plugged in when you reboot to Qflash. 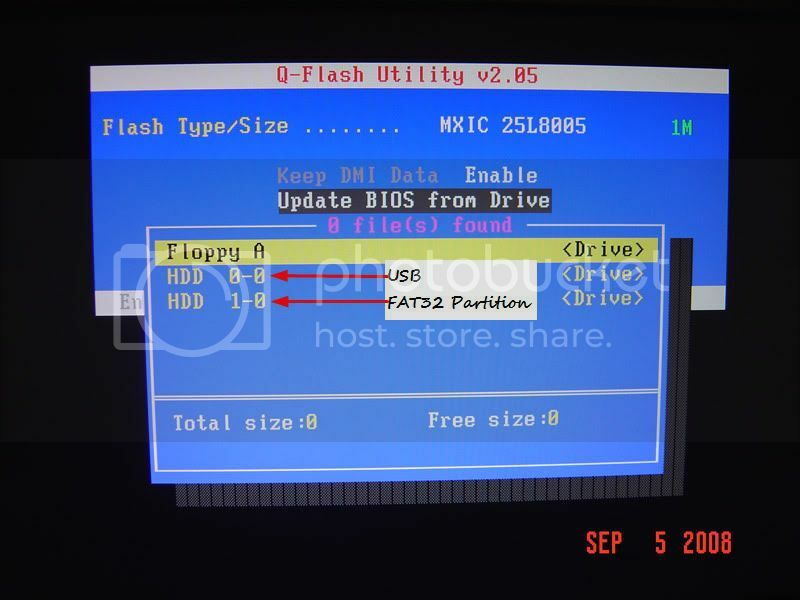 Once inside Qflash you will be presented with Floppy, or Drives/Disks, or HDD's options depending on what you have available, look thru each until you find your BIOS file and then flash it. Once you have flashed and rebooted back into the BIOS choose Load Optimized defaults and save and apply. This is a required step for the flash process to complete, and for the new BIOS to be properly loaded into the chip. Then reboot Back into the BIOS again before you go into windows. You will need to set your hard drive settings again in the Advanced BIOS page. MOST IMPORTANTLY do not try to load Windows if you are using a RAID setup without setting these disk settings again or you will corrupt your RAID Array. Please do not skip the above steps and try to load windows, this is for anyone who is reading this who is using RAID, which alot of us do. FlashSPI mentioned above as being included on the USB stick is only necessary when flashing via DOS. Your USB drive will be formatted During this process, all Data on it will be lost!! 3. Run the HPUSBFW program. 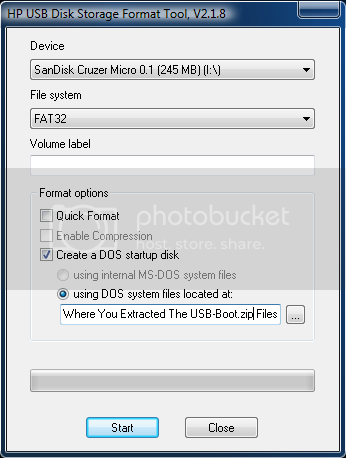 Select the correct USB device from the drop-down menu, set file system to FAT32/16/12 and check Create a DOS startup disk. 4. Then browse for the extracted boot files (now in the folder on your desktop from above extraction) and press start to begin formating it. 5. Once the device is done, download the BIOS file from the Gigabyte website for your board model and revision as well as the DOS based BIOS flashing tool which is included inside downloaded BIOS .exe files from Gigabyte. 9. Plug in your USB drive and reboot to enter bios. 11. Go into the Hard Disk Boot Priority Option In Advanced BIOS Features Page and select your USB drive as the first bootable drive. 13. Once it boots to the USB, you will see a Windows 98 screen, and then the DOS prompt. You will need to change the ^^ p35ds4.fxx ^^ in the above command to the exact name of the BIOS file you have. Last edited by Lsdmeasap; 04-27-2011 at 12:59 PM. You will need 2 blank floppy disks to flash using this method. Using Qflash is advised if you do have a Floppy Installed, and you will need only one floppy disk with Qflash. 2. Remove the MS-DOS bootable Floppy disk you just created from the floppy disk drive. 3. Insert a new floppy disk, and format it in the normal manner. 7. Go into the Hard Disk Boot Priority Option In Advanced BIOS Features Page and select your Floppy drive as the first bootable device. 10. Once it boots to the Floppy, you will see a Windows 98 screen, and then the DOS prompt. CMOS is a Acronym for "Complementary Metal Oxide Semiconductor"
Clearing the CMOS will erase the settings stored in the CMOS. It does not remove or change the BIOS itself, it only clears the user defined settings within the CMOS. When you clear the CMOS you will often likely see the error message "CMOS Checksum Error" on the next reboot. Do not worry this is a normal thing, please enter BIOS at this stage and Load Optimized Defaults, set your DDR2 voltatge and reboot again to the BIOS. The error will be gone after that. First thing to do is to shut down your System, and let it rest for 30 seconds to a minute. Then it is wise to unplug the Power Supply from the wall. Be sure to also Unplug the USB cables of any powered USB devices! Open your case and find the "Clear CMOS" jumpers. 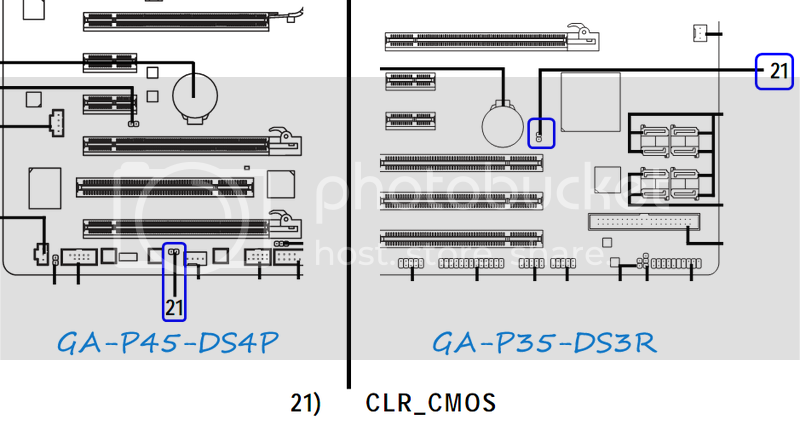 It is a 2-pin jumper normally located just under the or between the PCI-E slots in P35 boards and under the last PCI-R Slot in P45 boards. Once you have found these jumper pins you will need to get a Hard Drive or Optical Jumper (The same type you used to use on IDE Drives) and place this jumper on the "Clear CMOS" pins. Then press and hold the Case Power on switch for a minute. You may also want to remove the CMOS battery. This is optional and not Always necessary, but you may want to try it if you are having issues getting the CMOS Cleared. Now let the computer rest with this jumper on for 10-20 Minutes, this will ensure that the battery gets drained, and the CMOS is cleared. Some people will tell you it will only take a few seconds or a minute or two, but I find that to be false and it may indeed lead to a corrupt BootBlock and or a Bricked motherboard. When the 20 minutes is up, remove the jumper from the "Clear CMOS" pins, put the battery back in if you removed it, and close your case up. Plug the Power Supply back into the wall and restart the system. Then please follow above advice and Load Optimized Defaults, set DDR2 Voltages and Reboot. Corrupt BIOS BootBlock? It can happen to the best of us!! There is but only a FEW things you can try to do before you will have to RMA your board if you get a Bad BootBlock or Scanning Hard Drive for BIOS error message. This can be causes by any number of things, @BIOS, a Bad Flash, a Flash to the incorrect BIOS, a Power interruption during a flash... The list goes on. Here is a few things you can try in a attempt to recover your BIOS. You MUST have a Floppy Disk Drive installed and set as First Boot Device, BEFORE your system failure. It will not help you at all to try to install one after a BIOS error in a attempt to fix it with these methods. 3. Create an autoexec.bat with “flash895 bios_file_example_name.Fxx” in the content of the batch file, (without the quotes “ ”). Yes the space is there and is necessary! 5. Re-flash the BIOS & reboot. The AWARD BIOS does not automatically restore the BIOS information to the BootBlock. You will need to write the commands necessary to flash the BIOS into the Autoexec.bat file. The system will run the Autoexec.bat file, which contains the flash instructions. /CC = clear CMOS data after programming. /CD = clear DMI data after programming. /CP = clear PnP (ESCD) data after programming. /QI = use BIOS I.D. string from BIOS .bin file. /R = reset system after programming. /PY = program flash memory. /SN = don't save existing BIOS. Suggestions are more then welcome if you guys think I missed anything or need to address something further. Hope this at least will help some people a bit, and HOPEFULLY save a few from a BAD @BIOS Flash or Otherwise! It is possible to make the BIOS Auto-Recovery kick in (Dual BIOS) and re-flash the MAIN BIOS with the contents of the BACKUP BIOS. This is a simple and easy method for anyone to try before having to resort to other more difficult methods, or a RMA. 1. Shut off the power supply using the switch on the back of the PSU, wait 10-15 seconds. 2. Press and hold the case Power On swtich, then while still holding turn on the power supply from the switch on the rear. 4. The board will shut down. 5. Turn the power supply back on using the switch on the rear of the unit. 6. Turn on the motherboard by pressing the case power on button. Once the board starts this time you should see the Gigabyte splash screen, or POST page, then the Auto-Recovery from Dual BIOS will kick in. You will see a checksum error, and then recovery from BACKUP BIOS will begin. Once it is done reboot your machine and enter the BIOS and load optimized defaults then save/apply/reboot back to BIOS. Now you are done, and will be using whatever BIOS was in your BACKUP BIOS, From there you can attempt whatever you were previously trying, or update your BIOS to the latest version. If updating please use Qflash!! This only applies to Dual BIOS Motherboards. Last edited by Lsdmeasap; 01-07-2011 at 04:56 PM. Anyone who flashes their bios "the good old way" , with a created floppy boot disk and the relevant bios, flash app and autoexec.bat file copied over, that Gigabyte have started to use (at least for my board and latest bios) a New Flash utility (FLASHSPI.exe). At first it can be a bit disconcerting, because from the moment you boot the PC, with of course the floppy drive set as a bootable drive in the bios, the new Flash Bios Update Application (dos) needs NO input from you. Normally on "traditional" Flash Bios update applications (dos) when booting from a floppy, you would be presented with the loaded Flash Bios Update application screen and would have to manually select the bios image and initiate the flash by "OK". Also some of these Flash Bios Update applications would allow you to save a copy of the current bios image file. However this new GB Flash Bios update Application requires no user input whatsoever - so don't remove the floppy disk after boot until the Flash has completed. It's not as though you would be just stopping a Flash Bios update Application from loading, ie before loading up the bios image manually. Gigabyte should have warned users about this, as for years I've always been used to seeing the loaded up Flash bios update Application waiting for me to select a bios image and initiate the flash process manually (as per FLASH895.exe). If i wanted to change my mind, or realised I had the wrong bios image on the floppy disk, I could just stop right there and close the Flash bios update application - no harm done. However their new Flash bios update application/utility doesn't allow that. It appears to be supplied and configured in "silent" mode. Last edited by VorLonUK; 09-06-2008 at 01:16 AM. Great info VorLonUK, Thanks for the comment for sure! Last edited by Lsdmeasap; 09-06-2008 at 04:42 AM. Although this FLASHSPI.exe utility is setup to run "silently/unattended" and obviously works with "older boards" that first saw the FLASH895.exe, such as my GA-P35C-DS3R. - I wonder as it's a new utility, ie 2 years newer than the flash895.exe it is being used now not just for convenience, but as a possible recommendation on the latest boards which may use different/revised (newer) bios chips? I really do not think the BIOS chip matters much, and both programs would just clear DMI Pool and flash in the New BIOS. I am not so sure about all of this, maybe I can get Gigabyte to give me a good answer on why the change of the program itself, and why silent now. I will for sure be pointing out the issue you have brought forward, as I see it as a very valid point of failure. And possible point of Increased RMA's due to a interrupted flash. Especially with no words of warning on how things have changed from the Previous Flash Utility Process, and no explanation to new or old users to expect a silent unattended flash. WOW, Really! How are "New To Flashing" users supposed to know how long it takes, and when it is done with the new method being silent and unattended? As far as I can remember, there is minimal onscreen information given, but that might not be enough for the novice user. with a countdown of bytes to go. But it wasn't the lack of information/feedback that concerned me as much as there is no user input (where there has always been before). The moment you boot the PC with new bios media ready to be flashed, the whole operation is out of your hands - so basically don't touch that media until it is finished. In the past you booted straight to the Bios Flashing utility, where you choose the bios image, initiate the flash or if you wish, simply abort the Utility and exit - you had choices. Now when you boot with the flash utility, you have no choices (which could be seen as ok). My concern is people like myself where normally expecting to interact with the Flash utility software screen, might have a peer over the screen think it's locked up or not booted properly into the flash utility and inadvertently halt the Flash procedure. There is information, ie a few lines of short text in the top left of the screen during the flash - it is possible (I would think) to miss it if you are not aware things have changed and are automatic. Last edited by VorLonUK; 09-06-2008 at 08:46 PM. Ahh, well that is a little better then nothing. Thank you for this section. I could not find anything in the manual apart from the floppy technique. I don't have a floppy, not because of the $10 it costs to buy them but because I don't trust them when they are only used for emergencies. I find they fill up with dust and fluff and dirt and then don't work on the rare times you need them - such as a flash. Anyhow, I made myself a bootable CD and it all worked going from F4 to F8 (I had destroyed the BIOS, so I needed to flash). The next time I found this guide and it was so much easier to just use a USB stick from F8 to F9. I got to use it a second time moving to F10g beta - which works well BTW, and I will now make a bootable USB for next time. The only comment on the instructions is that I don't recall needing to manually extract anything with winrar, I think the current .exe downloads automatically extract, so it is even easier than your instructions. Ya, I thought it was about time We had some good info on BIOS flashing, it was very much needed. Glad to see it is already Helping some!! Well it is always good to have one, and have it hooked up and set as first boot device, like you said for emergency's. Having one and not having it hooked up and set as first boot does not help you any in a emergency. Ya they may self extract now for P45 boards I am not sure, just so used to using winrar as I use it all the time so I just out of habit right click files off the bat.